The president is scheduled to visit a section of newly installed 30-foot-tall border fencing in California on Friday. WASHINGTON — President Trump’s threats to close the southern border kept American businesses and Homeland Security agencies in the lurch Wednesday as the target of his ultimatum shifted from the Mexican government to U.S. lawmakers. A day after Trump appeared to back away from the shutdown idea while praising tougher enforcement efforts in Mexico – the original target of his threat – the president said he would close the 2,000-mile boundary unless Congress “immediately” addresses “loopholes” in U.S. immigration law that he believes are leading to a wave of family migrants from Central America. “If no action, Border, or large sections of Border, will close,” Trump wrote on Twitter. The president gave no timetable for his demand. Two senior administration officials said Wednesday that they believe Trump’s determination to act imminently had cooled, after top advisers and business leaders warned repeatedly that closing the border with Mexico – the nation’s third-largest trade partner – could lead to economic calamity on both sides. More than $1.5 billion in goods moves across the U.S. border with Mexico each day, and many leading U.S. companies rely on parts and materials crossing the border to sustain their global supply chains. Several White House aides said it is unlikely that Trump is preparing to order a closure this week, but they said he could change his mind in a flash. His top economic adviser said Wednesday that he remains unsure what Trump will do. Kudlow and other White House aides have discussed ways to blunt the potential economic damage from such a move, such as limiting closures to certain ports or finding ways to allow goods to continue flowing across the border while restricting people from crossing. The president is scheduled to visit a section of newly installed 30-foot-tall border fencing in Calexico, California, on Friday, leading to speculation that he could make a shutdown announcement against the backdrop of the steel barriers that he has made a centerpiece of his administration’s immigration platform. The current plan is not to close the border when Trump is there on Friday, a senior White House official said. A jump in unauthorized crossings has pushed arrests along the border to their highest levels in more than a decade, undermining Trump’s promises to protect the United States from Central American migrants he depicts as a grave threat to U.S. security. But 90 percent of those who arrived in March crossed between official U.S. ports of entry – they waded through the Rio Grande, climbed over border fencing or presented themselves to immigration authorities on U.S. soil outside of border barriers. Closing the ports of entry used by U.S. citizens, residents, authorized travelers and commercial trucks likely would have little effect on illegal migration. The president has threatened Mexico with border closures before, but Wednesday’s tweet was the first time he appeared to use it against U.S. lawmakers. GOP senate Majority Leader Mitch McConnell, R-Ky., and other leading Republicans have warned the president that it a bad idea to go after Congress in this way. Joshua Bolten, president and CEO of the Business Roundtable trade group, sent an open letter Wednesday to Kudlow and other top White House aides, urging them to talk Trump out of closing the border. “Even the threat of a border closure injects significant uncertainty for American companies who depend on legal workers who cross the border each day to operate their businesses,” wrote Bolten, who served as President George W. Bush’s chief of staff. But Kudlow said Wednesday that Trump could decide any moment whether to follow through on the threat, indicating that top aides were waiting for a presidential directive. U.S. Customs and Border Protection operates 27 crossing points along the Mexico border, and vehicle wait times have stretched to several hours this week as more CBP officers have been reassigned to assist the U.S. Border Patrol with soaring numbers of Central American migrants. White House advisers have asked Homeland Security officials to provide guidance on the nuts and bolts of how a border closure might work, and whether it would be possible to conduct a partial shutdown that satisfies the president while still allowing billions of dollars in bilateral trade to continue flowing. Under such a scenario, commercial trucks and trains loaded with goods and materials could continue to pass, but passenger cars and pedestrians would be blocked from entry into the United States. That would potentially strand thousands of U.S. citizens and legal residents in Mexico and almost certainly would disrupt communities that straddle the border. But it would allow the White House to assuage U.S. business leaders who have been alarmed at the president’s willingness to sever commerce with Mexico. “The White House has heard from a lot of CEOs and advisers that the economic impact of shutting down the border would be catastrophic,” the official said. Kudlow acknowledged that restrictions on passenger vehicles and pedestrians would not avert economic damage. He noted that many workers and tourists cross the border every day. Mexico’s foreign minister, Marcelo Ebrard, said this week that U.S. officials, including Secretary of State Mike Pompeo, had assured him that the United States government does not plan to close the border. Ebrard explained that U.S. officials told him that they were overstretched by the recent surge in migrants at the border. He said that strain on U.S. personnel was likely to cause a “slowdown,” particularly at crossings between Ciudad Juarez and El Paso, Texas. On Wednesday, a day after cutting short a trip to Europe, Homeland Security Secretary Kirstjen Nielsen flew to El Paso to visit Border Patrol facilities; stations in El Paso have more than 3,400 migrants in custody, according to DHS, with facilities at 280% capacity. DHS officials say they arrested or encountered more than 100,000 migrants along the border in March, the highest one-month total since 2006, including record numbers of parents traveling with children. 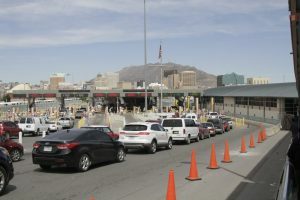 At least 545 CBP officers have been redeployed from the ports of entry to assist Border Patrol agents, and the shift in resources has caused long backups for trucks and cars waiting to be cleared for entry. Nielsen on Tuesday sent a memo to DHS employees, calling for volunteers from the Coast Guard, Citizenship and Immigration Services and other Homeland Security agencies to go to the border for temporary assignments.